The number five is the most dynamic and energetic of all the single-digit numbers. It is unpredictable, always in motion and constantly in need of change. What kind of change? We don't know it depends on the mission. At an Arabian horse show, most stud farms would prefer to win as many Gold Championships as possible. And so we take our hats off to the team of Al Khalediah Stud who manage to win five out of six Gold Championships at the 9th Saudi Nationals. What an amazing success and mission (nearly) complete. Mubdeat Al Khalediah and Raslan Al Khalediah achieved Gold in the Yearling Championship. Resalat Al Khalediah and Wajeh Al Khalediah repeated their recent success at the Asharqia Arabian Horse Classics in the Junior Championship. Ibn Jameelat Al Khalediah accomplished Gold Champion Senior Stallion. Their stablemate Khadija Al Khalediah received Silver Champion Senior Mare bested only by Unanimous Gold Champion Senior Mare, Yamama Al Khalideyah (Al Adeed Al Shaqab x Rahamat), bred and proudly owned by Al Khaled Farm. Tala Stud's FS Coco Chanel was named Bronze Senior Mare Champion. Al Khaled Stud enjoyed another success with their Fadi Al Shaqab daughter Yuser Al Khaled, when the two years old won Silver Champion Junior Filly with Maysah Gharnatah, bred and owned by Naser Bin Klifeekh Al Hajeri, winning Bronze. Next to Gold winner Wajeh Al Khalediah, the Emerald J son General, owned by Naif Fahd Abdullah Al Ouidah, received Silver Champion Junior Colt and Mishal Mohammed Al Yousif celebrated his Bronze Champion Junior Colt, Assam Al Shaqab. 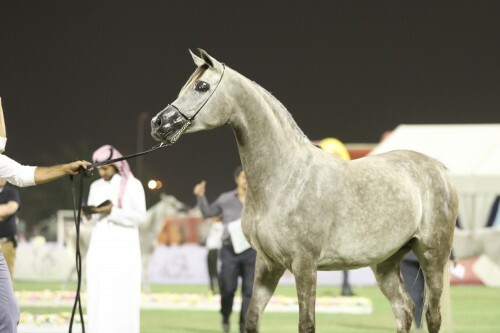 It was the EKS Alihandro daughter Rahbah Athbah, proudly owned by Al Mohamadia Stud, who achieved Silver Champion Yearling Filly with Sabha Al Muawd, by SMA Magic One, winning Bronze. Al Mohamadiah Stud won another Silver Championship with the Yearling Colts: Mazin AM, by Abha Qatar, was the choice of the judges. Bronze was given to Fahd Al Arab, bred and owned by Al Arab Stud. And who was next to Gold Champion Senior Stallion Ibn Jameelat Al Khalediah, who already won a Silver and Bronze Championship in Saudi Arabia this show season? At the National Championship, it was a close case. 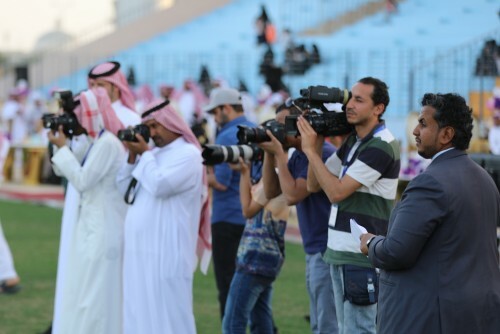 Ibn Jameelat Al Khalediah won because of higher points with Yaasoup Al Muawd winning Silver. Bred by Al Muawd Stud, the Shanghai EA son Yaasoup Al Muawd is proudly owned by Al Khalediah Stud, too. Bad'e Al Hawajer, a Marajj son bred by Dr. Ghanem Mohammed Obaid Al Hajri and owned by Abdul Aziz Bin Mohammed Bukhamseen, received Bronze. Thank you to the organizing team of King Abdulaziz Arabian Horse Center conducted by Mr Loui Al Hashem for arranging everything so elegant and smooth. Arabian Horse Global Network would like to extend our thanks for the excellent collaboration.